Jorge Bernales Ballesteros, Alonso Cano en Sevilla, Seville 1976, p. 121, citing the lost painting in the Bravo collection. Francisco de Herrera’s education was with his print-maker father and his earliest dated works from 1609-10 are in fact engravings. His first independent paintings are documented in the years 1614-1616 and reveal an artist of mannerist training but with strong naturalistic tendencies. The awkwardness of these early works disappears in a series of imposing canvases from the 1620s. The Ecstasy of St. Francis Xavier (University of Seville),The Entry of St. Bonaventure into the Franciscan Order (Madrid, Museo del Prado, 1628), St. Bonaventure Taking Communion from an Angel and St. Francis Curing the Young St. Bonaventure (both Paris, Musée du Louvre, 1628) reveal the fluid painting style of the artist’s maturity, as well as his penchant for vigorous physiognomic types. With other large-scale works of the next decade Herrera develops into an artist of great pictorial drama, with boldly-conceived compositions populated by expressively-robed figures, their individuality articulated by sharply delineated facial features. Herrera’s St. Basil Dictating His Rule of 1638 (Paris, Musée du Louvre) is a fine example. Herrera’s work in the 1640s becomes more elegant and at times intimate – ranging from the ambitious Multiplication of the Loaves and Fishes (Madrid, Archbishop’s Palace) to the tender Joseph and the Christ Child (Madrid, Museo Lazaro Galdiano). Herrera died in Madrid, where he had evidently moved to escape the plague. He was described as having an irascible personality – which may have been a factor why his son, the painter Francisco Herrera the Younger (also known as Herrera el Mozo), spent much of his career in Italy, returning to Spain only on the death of his father. His most celebrated student, Diego Velazquez, seems to have remained in his studio for little more than a year. San Antonio de Padua de 2 varas y tercia y 2 y media de ancho comprado a don Antonio Fortajada. Procede del Convento de San Antonio de esta ciudad, original de Alonso Cano. Hincado el santo de rodillas, predica a los peces en la orilla del mar de Padua y salen a escucharlo, cosa que no han hecho los habitantes de la ciudad. Un lego que le acompañaba está detrás sorprendido. Por entre las dos personas se ve una parte de la población y delante hay un árbol y gran proporción de celajes. Agradable y hermoso colorido. Es cuadro de primera clase. The location of the painting is not known from the time the painting left the Bravo in 1853 until it reappeared in the collection of Don Millán Delgado in 1980, but presumably it had remained in Seville over the years. By that time its appearance had been compromised by old retouching and dirty varnish, only recently removed. Although Valdivieso saw the painting then and recognized Herrera’s authorship, its identity was again forgotten following its owner’s death. When lent to the 1986 exhibition at the Prado --Carreño, Rizi, Herrera y la pintura madrilena de su tiempo-- the painting was catalogued as anonymous, ca. 1630-40. However, ten years later, the author of that catalogue, Alfonso E. Pérez Sánchez, now writing with Benito Navarrete Prieto, reassessed the painting’s authorship and firmly attributed it to Herrera the Elder, associating the work with the lost St. Anthony Preaching to the Fishes from the Convento de San Antonio and the Bravo Collection. St. Anthony was born in Lisbon in 1195, but is most closely associated with the city of Padua, where he died in 1231 and where his shrine (the great basilica known as “il Santo”) is located. An early Franciscan (St. Francis was but fourteen years his elder) known for his preaching, Anthony was greatly venerated in his lifetime and was canonized within a year of his death. The legend of Anthony and the fishes relates how the saint had gone to Rimini to preach, but met with resistance from an obstinate populace who had refused to listen. At last St Anthony, inspired by God, went down to the sea-shore, where the river runs into the sea, and having placed himself on a bank between the river and the sea, he began to speak to the fishes as if the Lord had sent him to preach to them, and said: "Listen to the word of God, O ye fishes of the sea and of the river, seeing that the faithless heretics refuse to do so." Anthony’s sermon to the fishes parallels the legend of St. Francis’s preaching to the birds, and although the subject is potentially of great visual appeal, it was infrequently depicted in Renaissance and Baroque painting: perhaps the most famous is Veronese’s canvas in the Galleria Borghese. Herrera places St. Anthony kneeling on a ledge overlooking the water, his arms outstretched and his hands held in gestures connoting greeting, blessing, and teaching. 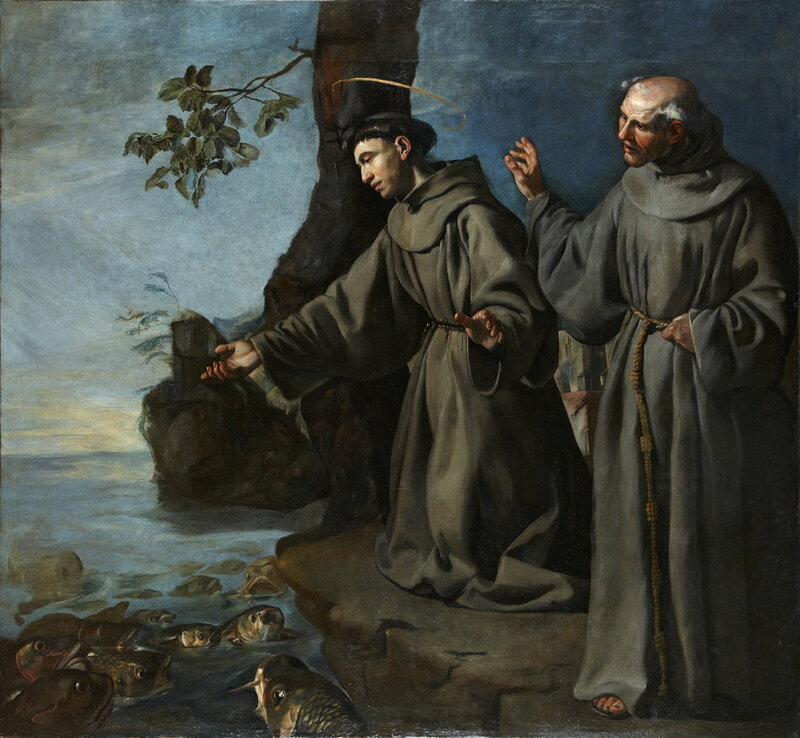 His expression suggests both introspection and sympathy for his audience, while his companion, an elderly Franciscan brother, raises his hand and grasps his rope belt in astonishment at the behavior of the fish. Architectural elements between the two figures serve as a shorthand representation of Rimini, whose citizens ignored the saint. The prominence of the tree may allude to a later event in the saint’s life; in order to seek peace and quiet Anthony built a tree-house in a walnut tree to serve as a hermitage. Valdivieso considers the present painting to have been painted around 1640. “Saint Anthony of Padova, 2 1/3 yards by and two and a half wide, bought from don Antonio Fortajada. It comes from the Convent of San Antonio of this city, original of Alonso Cano. On his knees, the saint preaches to the fish on the shore of the sea of Padua and the fish come out to listen to him, unlike the inhabitants of the city, who had not listened. A lay brother who was accompanying him stands behind him in awe. In between the two persons, a part of the town is visible and there is a tree in front of it and a large expanse of sky. Pleasant and beautiful color. It is a first-class painting.” Manuscript Catalogue, Bravo Collection, University of Seville, quoted by Valdivieso. Gonzalez de Leon, however, states that Bravo had acquired the painting on Feb. 6, 1814. From the Fioretti of St. Francis, chapter xl.